Microsoft is pleased to announce the release of the new MCSA: Windows Server 2016 certification. Exam 740 is scheduled for beta release in early October 2016, with the other exams following soon after. Exam 743 is scheduled for beta release in late July 2016. MOC courses corresponding to all four Windows Server 2016 exams are scheduled for release in September 2016, while practice tests will be available shortly after each exam beta period ends. New options for specialization and continuing education through the MCSE program will be announced later this summer. Exchange Analyzer is a PowerShell tool that scans an Exchange Server 2013 or 2016 organization and reports on compliance with best practices. Exchange Analyzer is a community project, and is currently a beta release seeking feedback and results from real world environments. To read the latest information about Exchange Analyzer click here to visit the project’s ReadMe on Github. More information can also be found in the Exchange Analyzer Wiki. 2. Extract or copy the following files and folders to a computer that has the Exchange 2013 or 2016 management shell installed. For example, place all of the files and folders in a C:\Scripts\ExchangeAnalyzer folder. Important Note: if you are updating your copy of Exchange Analyzer please make sure you copy the updated module in step 3. 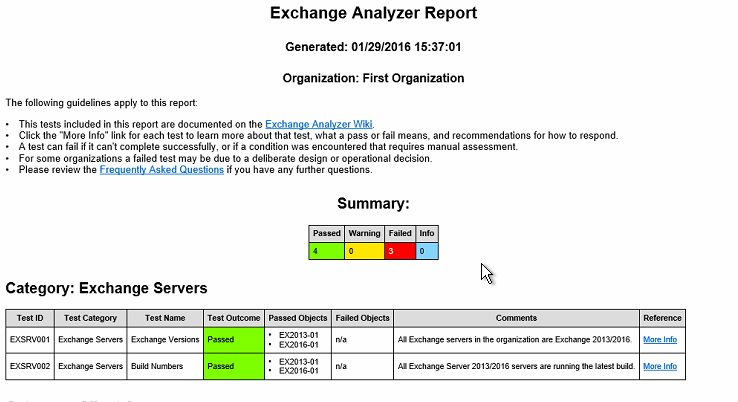 Exchange Analyzer produces a HTML report with a simple “Passed/Failed” indicator and a list of passed and/or failed objects. Links to more info are provided to assist you with further interpretation of the report. Before submitting feedback or questions please review the Exchange Analyzer FAQ. You can help with bug fixes by submitting issues on Github. If you would like to contribute fixes or other code please review theExchange Analyzer Wiki. You can also send email to feedback@exchangeanalyzer.com. Second beta release. Details of changes are here. Are you an expert in designing and managing Exchange Server? Are you responsible for the Exchange Server 2016 messaging environment in an enterprise environment? If so, here’s your chance to start down the path to the MCSE certification for free AND help us improve the quality of this exam! We are opening up 350 beta seats for this beta exam (exam number: 70-345)… This means you can take the exam for free!! BUT… the seats are limited to first come, first served basis–so, register today (these codes will only work through February 12, 2016, meaning you have to register AND take the exam on or before that date)–and we need you take the exam as soon as possible so we can leverage your comments, feedback, and exam data in our evaluation of the quality of the questions. The sooner you take the exam, the more likely it is that we will be able to use your feedback to make improvements to the exam. This is your chance to have a voice in the questions we include on the exam when it goes live. To prepare for the exam, review our prep guide and practice the skills listed: https://www.microsoft.com/en-us/learning/exam-70-345.aspx. To prepare for this beta exam, check out my recent blog for ideas: https://borntolearn.mslearn.net/b/weblog/archive/2015/12/31/just-how-does-one-prepare-for-beta-exams-without-preparation-materials. ***Register for the exam at the same site and use code EXCH2016010B to take it for free, but these codes are only valid for exam dates on or before Feb. 12, 2016. Remember: There are a limited amount of spots, so when they’re gone, they’re gone. You should also be aware that there are some country limitations where the beta code will not work (e.g., Turkey, Pakistan, India, China, Vietnam); you will not be able to take the beta exam for free in those countries. Also, keep in mind that this exam is in beta, which means that you will not be scored immediately. You will receive your final score and passing status once the exam is live. Well…what are you waiting for? Register before all the seats are gone!